Office Space - Burwell, Cambridgeshire. 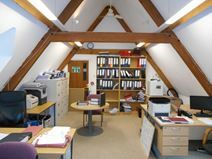 Located in Burwell, a village just outside Cambridge, this serviced office is set in an idyllic, historic building which retains many period features, including the exceptional oast house. These are comfortable, well-equipped offices, ready for immediate occupation. On-site amenities include internet access, parking and an on-site management team. For maximum flexibility, the offices are accessible 24-hours a day.